There are two reasons, ok maybe three reasons why I have started solely making ice cream the old fashioned way...at home! Ok maybe it's not truly the old fashioned way because I'm not exactly sitting there churning it by hand, but you know what I mean. First of all, it all started because my daughter has quite a few food allergies so she basically cannot have any of the ice cream at the store because of cross-contamination. Ice cream is like my favorite thing ever so my daughter has got to have some! What kind of life is life without ice cream every now and again?! Secondly, and most importantly for my average reader, I really love that I know exactly what is in my ice cream. It doesn't have all the weird, funky ingredients that almost all of the store bought ones have. It can have as few as 3 or 4 ingredients. And thirdly, because it is seriously so dang good that I wouldn't want it any other way! Don't get me wrong, I will still go out and get store bought in a pinch if I don't have the ingredients or something and need a quick fix, but I have become a homemade ice cream snob and definitely prefer it this way now. I could go on and on about this but it has definitely made for a really fun tradition in our family that we do almost every weekend and my daughter could not love it more. She loves the whole process of helping get it ready and watching it churn, and then of course the best part...devouring it! Ice cream makers have quite a variety for price. There are some dang expensive ones out there, but the one I decided on was $28 from Amazon and it has worked like a dream. I couldn't be happier. If this one ever gives out on me I'm sure I'll buy the same one again. Some makers don't require any ice, you just pour your ingredients and it magically, quietly forms ice cream. These are usually the pricey makers though. Mine does require about 8 pounds of ice and is quite noisy, but it doesn't bother me. As far as ice goes, you can got out and buy an 8 pound bag of ice at a grocery store, or get it from your freezer at home. I actually don't have an automatic ice maker in my freezer so I just do a whole bunch of ice trays and save them up in a big bag in a corner of the freezer. I've never counted, but I would guess I need about 12 or so ice trays to get as much as I need for a batch for my ice cream maker. I have tried many different recipes for ice cream, but this one has become my very favorite. It is one of the harder ice cream recipes I have made but it is definitely worth the hassle! You can just make the cheesecake ice cream base and get creative with what else you do with it. I think that would be delicious with pairing it with sliced up bananas and the graham cracker crust chunks to make it taste like a banana cream pie. There are plenty of other things you could try. The possibilities are endless! I hope you enjoy this ice cream! And maybe I have at least gotten some of you to maybe consider getting a $28 ice cream maker J I have posted the link for the ice cream maker I bought at the bottom of the article. 1. Combine 1/2 cup sugar and cornstarch in a small saucepan; gradually stir in water until smooth. Stir in blueberries and lemon juice; bring to a boil. Reduce heat to low and simmer, uncovered, until slightly thickened, about 5 minutes. Cover and refrigerate until chilled, about 30 minutes. 3. Combine graham cracker crumbs, 2 tablespoons sugar, and cinnamon in a large bowl; stir in butter. Pat into ungreased 10x15-inch baking pan. 4. Bake crust in preheated oven until lightly browned, 10 to 15 minutes. Cool completely on a wire rack, then crumble crust. 5. Whisk 1 1/2 cups sugar, pudding mix, whipping cream, milk, and vanilla extract in a large bowl. Fill ice cream freezer cylinder two-thirds full. Freeze according to manufacturer's directions; refrigerate remaining mixture until ready to freeze. Whisk remaining mixture before placing in cylinder to get rid of lumps. 6. 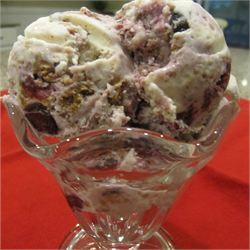 Layer ice cream, graham cracker mixture, and blueberry sauce three times in a large bowl; swirl to combine. Freeze until ready to serve. 7. All done! Now take a photo, rate it, and share your accomplishments!